Whether through tweets, press conferences, or unscripted remarks, it’s becoming clear, that Donald Trump’s words have an immediate impact on the stock market. 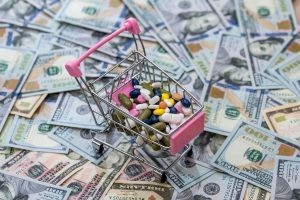 Immediately following Donald Trump’s election victory in early November, healthcare stocks got a bump, with many thinking pharmaceutical stocks would be one of the big winners under a Trump presidency. Healthcare and pharmaceutical stocks had been under pressure in the lead up to the election as investors presumed Clinton was destined to become the next president of the United States. In keeping with President Obama, a Clinton presidency would introduce drug-pricing pressures. Further, many healthcare insurers had said they were losing money after on the Affordable Care Act, colloquially referred to as Obamacare. But, with Trump in the White House and Republicans in control of Congress, Obamacare is up in the air. And with it, many thought, price controls. Pharma stocks and healthcare stocks were early winners. In the weeks preceding the U.S. election, the iShares Nasdaq Biotechnology ETF (NYSE/IBB) lost almost 18% of its value, falling from around $300.00 per share in late September to a low near $246.50 in early November. After the surprise election result, the iShares Nasdaq Biotechnology ETF was trading near $290.00 per share. The PowerShares Dynamic Pharmaceuticals Portfolio ETF (NYSE/PJP) followed the same trajectory; down roughly 17% in the weeks before the election then rebounding 12%. Pharmaceutical and healthcare stocks got hit during the press conference after Donald Trump criticized the industry during the January 11 news conference. In fact, healthcare and biotech stocks fell sharply during the news conference, right after Trump said drug makers are “getting away with murder” when it comes to pricing. The iShares Nasdaq Biotechnology ETF fell approximately 3.5% during Trump’s news conference. The PowerShares Dynamic Pharmaceuticals Portfolio ETF faced a similar fate. Lockheed Martin’s share price took another hit after Trump reiterated his stance during the January 11 press conference, saying the F-35 program was way behind schedule and over budget. What this news conference shows us is that Donald Trump can create short-term opportunities for investors; whether it’s buying on the dip, shorting, or selling on positive news. By the looks of things, Trump will present investors with a lot of these kinds of opportunities over, at least, the next four years. That’s because there are investing strategies that can help investors make money on a consistent basis—no matter what the broader markets are doing. Led by licensed, industry professionals, Learn-To-Trade.com is the oldest and leading provider of stock market trading courses in Canada. With our stock market trading course, we can teach investors of every skill level how to trade more confidently and profit consistently. Learn-To-Trade.com’s stock market trading course will teach you how to read stock charts, about fundamentals, risk management, and capital preservation. You will also learn about stock options, stock index trading, futures trading, commodities trading, futures option trading, and FOREX trading. “President Elect Donald Trump Holds Press Conference,” YouTube, January 11, 2017; https://www.youtube.com/watch?v=fAkumy7_Pbc. “Big Pharma Lost $24.6 Billion in 20 Minutes During Donald Trump’s Press Conference,” Fortune, January 11, 2017; http://fortune.com/2017/01/11/donald-trump-press-conference-biopharma-stocks/. “Donald Trump,” Twitter, December 22, 2016; https://twitter.com/realDonaldTrump/status/812061677160202240.